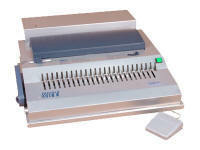 The CB-240e electric comb binding machine will punch up to 25 sheets of 20 lb. paper and bind up to 324 sheets in a 1.5" plastic comb. The CB-240e has built-in margin and punch depth guides as well as an adjustable edge guide for proper paper alignment. It features an open throat for punching larger paper sizes, 24 pin disengageable punching dies, foot pedal punch control, and more. The CB-240e provides the flexibility and durability that one seeks in a disengageable die comb binding machine. 19" x 20" x 6 3/4"
 Sheet capacity quoted includes 20 lb. bond paper only. Subtract 8-10 sheets to accommodate covers. Spines have hooks to prevent pages from slipping out. Economy Leatherette Cover Pricing - Kidskin leather-embossed document cover. Premium Leatherette Cover Pricing - Latex-saturated, kidskin embossed cover material. Thank You For Visiting Lee Ryder Lamination's Website. We Are Your Online Store For All Your Lamination, Photo Id System And Binding Needs!